Social media marketing is not the easiest digital marketing element to get right for any business. There are so many social media trends out there that it can be a tad overwhelming. You can find yourself becoming prone to some fatal social media marketing mistakes, without knowing. How are you creating your social media content? Are you using assumptions of what you think your social media audience wants? In all honesty, this approach is problematic. You need to conduct some extensive research of how your competitors are utilising their social media channels. You need to know your audience (your target market) inside and out! Research away. What are your audience’s interests? What are their challenges and concerns? How much time do they spend on social media platforms? If you can answer these questions, you can start developing an audience profile that can be used in your social media marketing for your business. Check out social media analytics such as Facebook insights and Twitter Analytics, which are freely made available to you via the native platforms. 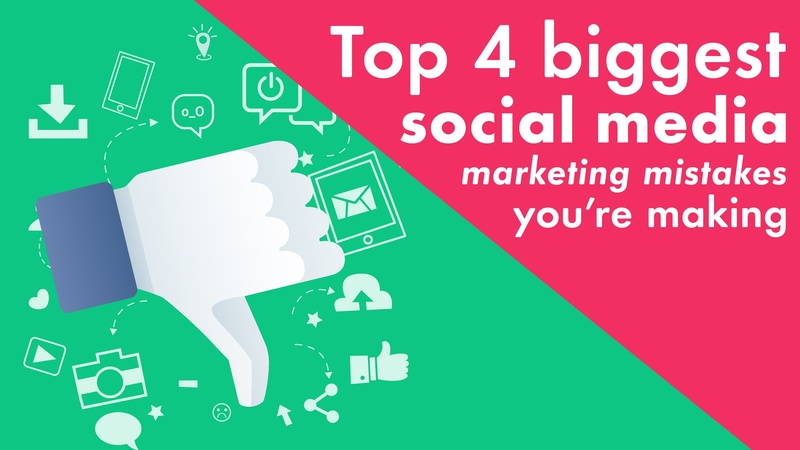 It is vital to identify which social media channels your target audience is most active on. Are they constantly using LinkedIn, Twitter, Instagram or Facebook? This is important knowledge. If you haven’t conducted audience research, you won’t know what social media platforms your customers are using. You must be where your audience is and engage them there. By distributing content to all social media channels, you’re spreading yourself thin and are wasting time, which affects your bottom line. Rather concentrate your social media marketing efforts on specific social media channels. Having the ability to pre-schedule all your social media posts for Twitter, Facebook and LinkedIn may save you time, but too much social media marketing automation can make your social media profiles appear robotic. You’re no longer interacting and engaging your audience, and building relationships with prospective customers. Of course, it is recommended to schedule posts for certain times when your audience is most active on social media channels. But don’t forget the human element! Try out different types of visual content be it videos, images and animates GIFs to see what resonates with your audience. Social media marketing at the end of the day is all about experimenting. However, at the same time, remember to measure the results of different types of visual content, compare and contrast then adjust your strategy going forward. When creating social media content, making use of the latest marketing technology and social media platforms, we suggest keeping these mistakes in mind. Soon you will be content marketing will be on point and with the advice we’ve provided your social media marketing will evolve. Social media success is only a click away!